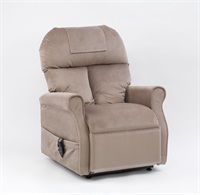 The Denver Rise & Recline Armchair features a Dual Motor Mechanism allowing you to operate and move the footrest and the backrest interdependently. 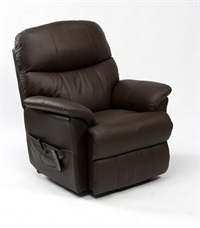 This provides countless amounts of recline options, helping you to find your most comfortable position. The smart button helps you bring the chair back to its normal sitting position. 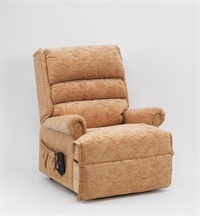 The Denver Rise & Recline Armchair features a Dual Motor mechanism, this allows you to operate and move the leg rest and the backrest independently. 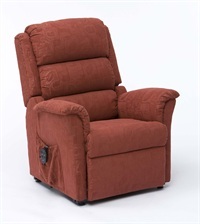 This provides countless amounts of recline options, helping you to find your most comfortable position. The Smart button helps you bring the chair back to its normal sitting position. The Denver chairs offer a luxurious fabric that is produced by a family run company based in Belgium and is available in a New Chenille Vanessa fabric (Cream, Sandstone, Green and Terracotta). 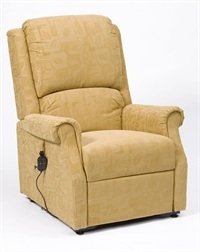 • Dual lift & recline 3-way mechanism. • The footrest can be elevated and the backrest can be reclined independently. • Easy to use electronic remote control with convenient side pocket. • Ergonomically contoured seat & back. • Built in convenient storage pocket. • Five button hand controller, including the Smart Button. • Battery back up facility included.